← #120 – The Snowdon Halfshoe? What’s a Halfshoe?!! 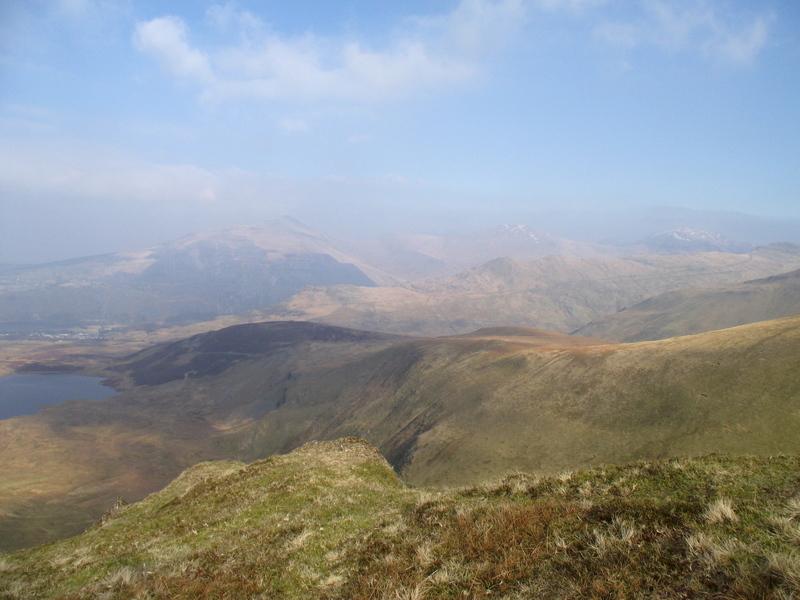 On the Snowdon ‘Halfshoe’ trip (see #120 of last week) I had stopped at the top of the PYG Track to admire the view. Recently I’ve been getting round to walking hills that I’ve been driving past for years, and it was good to look round the horizon mentally ticking off the summits I knew. 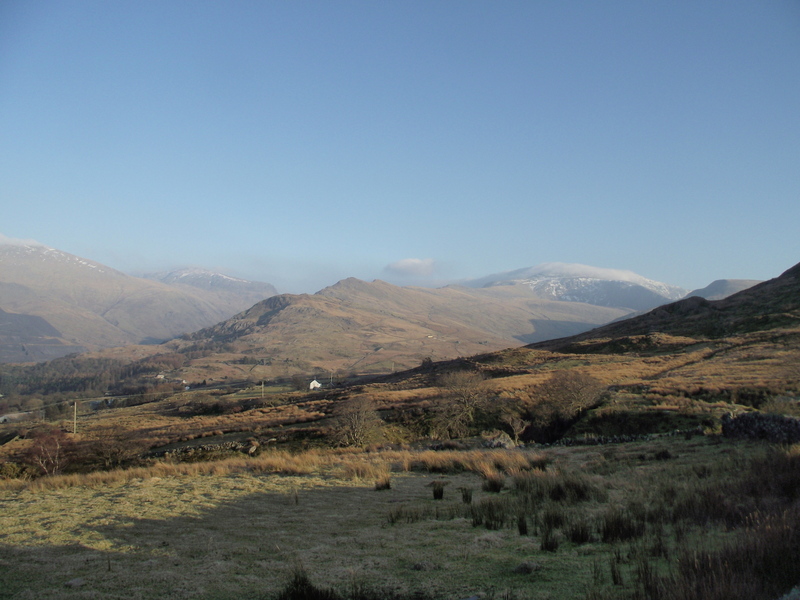 Then I looked northwest, and saw there was some unfinished business in that direction – it looked like Moel Eilio was due a visit! An easy track to start with …. …. followed by even more up!! 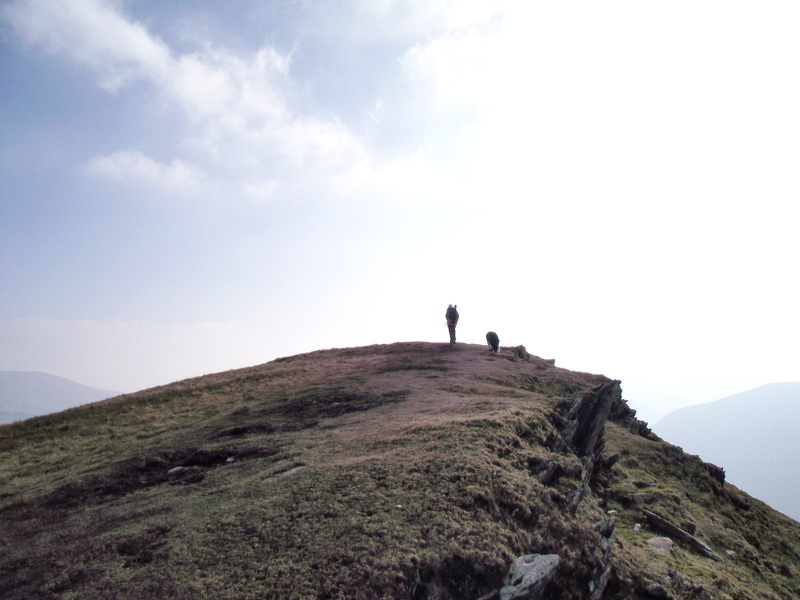 Another fine sunny day a few days after the Halfshoe walk gave the opportunity for a trip to Moel Eilio. A bit of research (isn’t Google just brilliant!) resulted in a car parking opportunity that cut out about forty minutes of road walking. 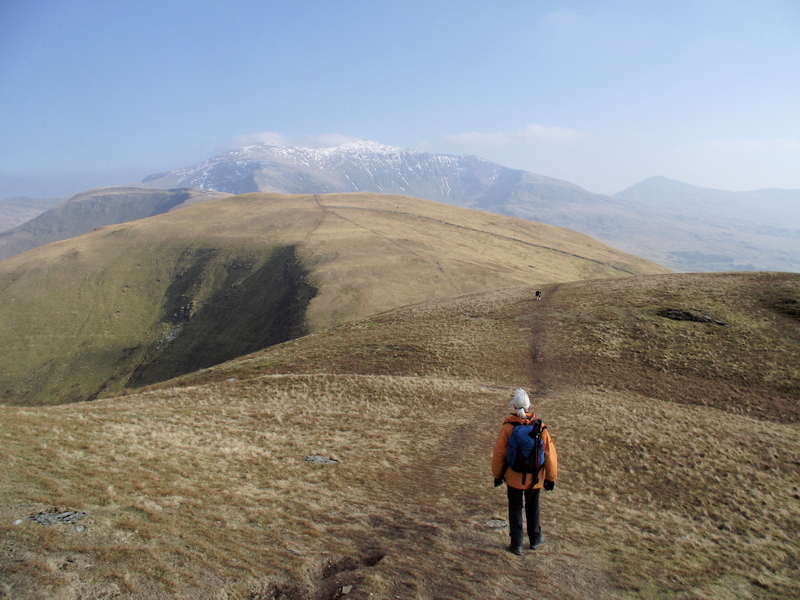 When we did get our boots on we found a broad track giving easy access to the northern slopes of Moel Eilio, but eventually we had to get down to some serious uphill. 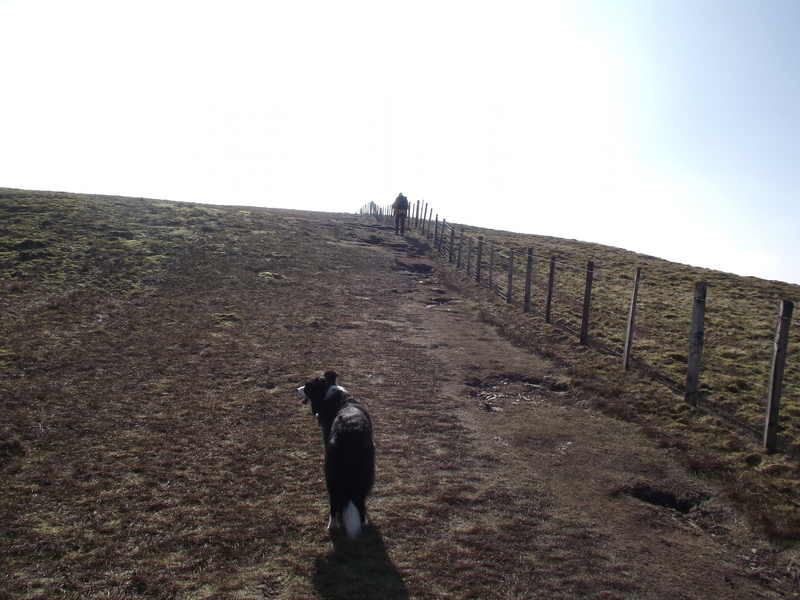 ‘Mist’ finds another dog …. 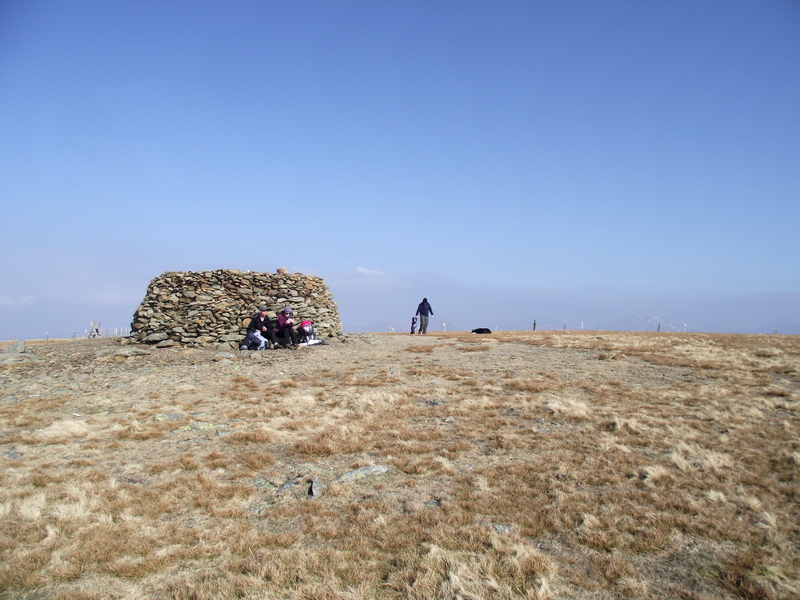 The ascent didn’t really have that ‘wow’ factor, with little to look at except more ‘up’, but as we reached the surprisingly busy summit at 726 metres altitude, the view suddenly opened with a stunning panorama, and a superb switchback of a ridge ahead. 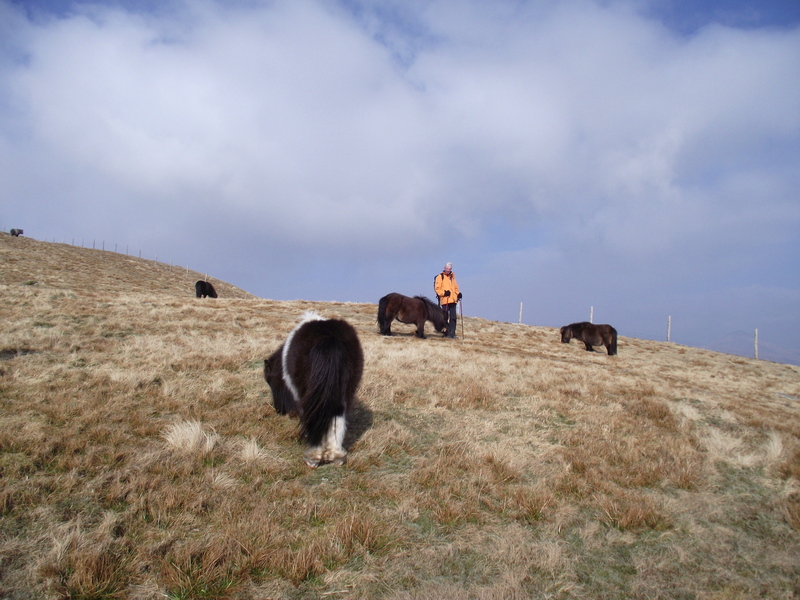 Coming over one crest we almost bumped into a herd of wild ponies, as small as ‘Shetlands’ but built like small barrels! 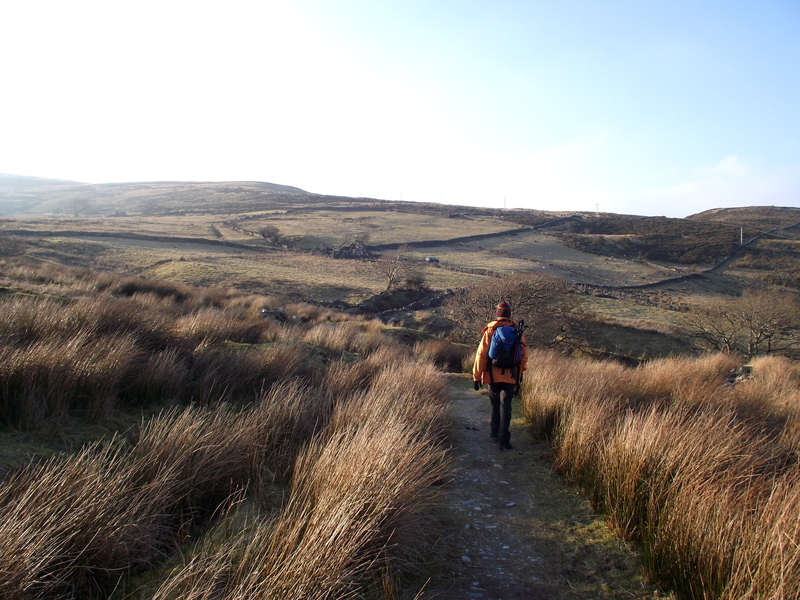 Then the switchback ridge continued, looking at times like the Brecon Beacons, except that the Beacons don’t have views towards Yr Wyddfa (Snowdon) ahead. 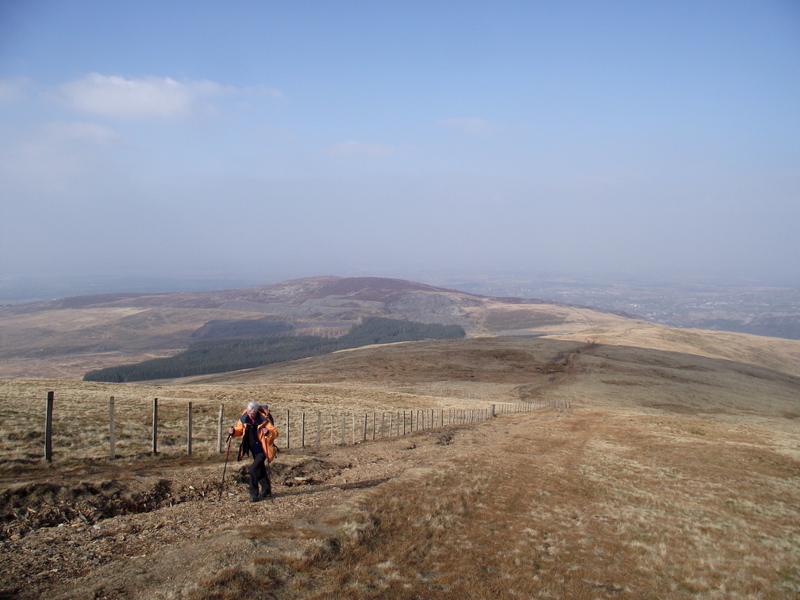 Our descent route, the broad ridge of Cefn Drum. 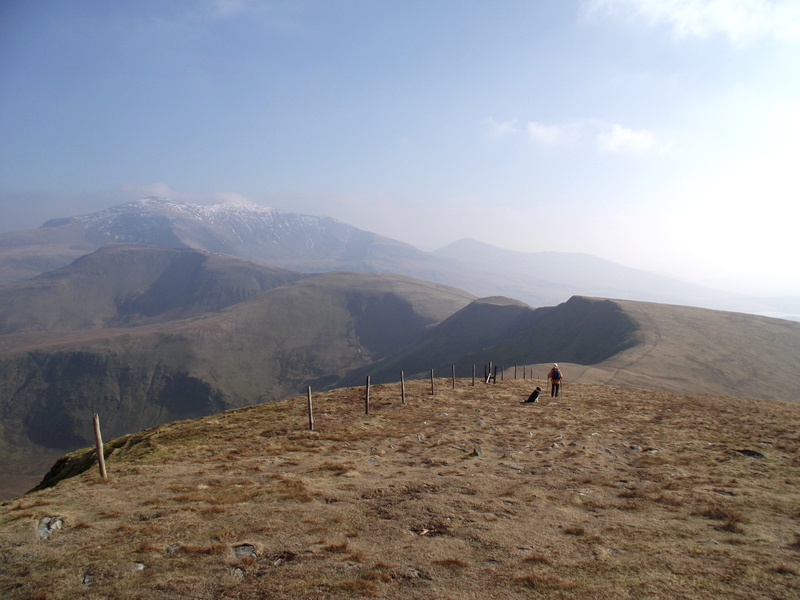 Looking back to Moel Eilio …. 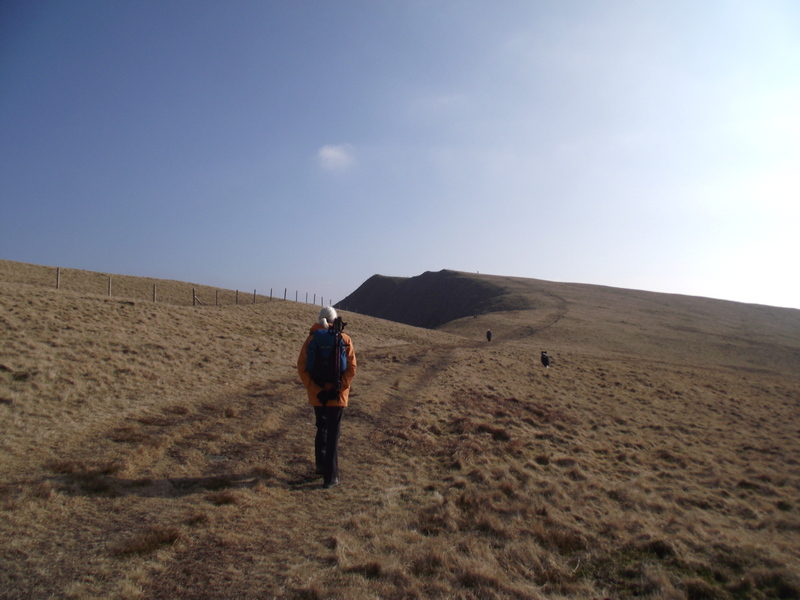 As we approached the final summit of Foel Goch, our descent route was clear – I’d decided on the broad grassy ridge of Cefn Drum, rather than following the good bridlepath down the valley of Maesgwm running parallel to the ridge. This had the advantage of great views for most of the way down, but the final steep bit was through ankle-grabbing heather, not exactly an instant hit with Chris. 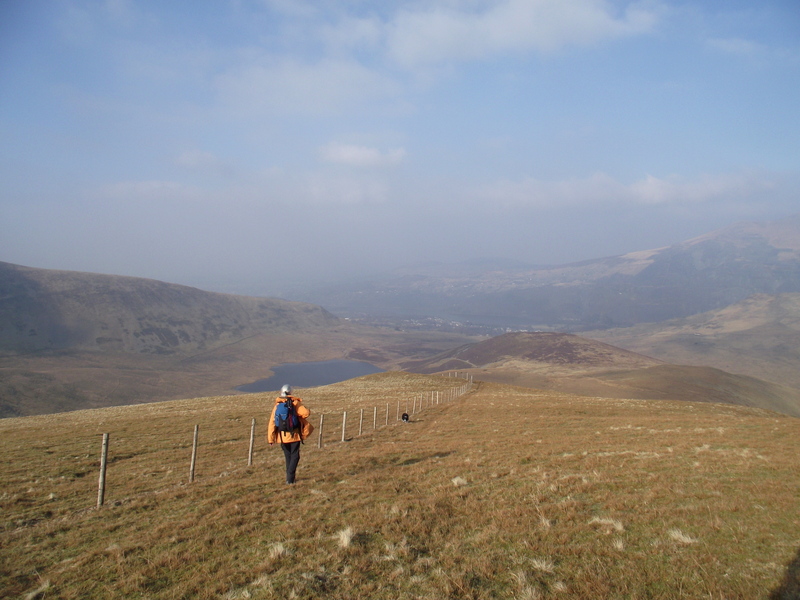 A bit of devious zig-zagging on my part ‘sorted’ it, dropping us down to the small lake of Llyn Dwythwch. 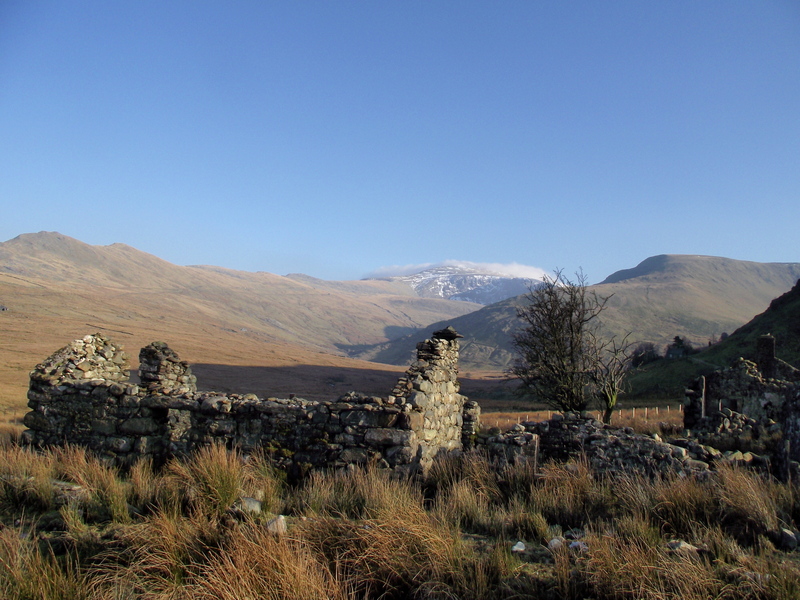 From there we headed down to the bridleway passing the ruined homestead at Brithdir. A swift Royal Marine style ‘yomp’ soon had us back at the car. Thankfully I managed the drive back to Llanberis down the narrow lane without removing the side mirrors! This entry was posted in 5. 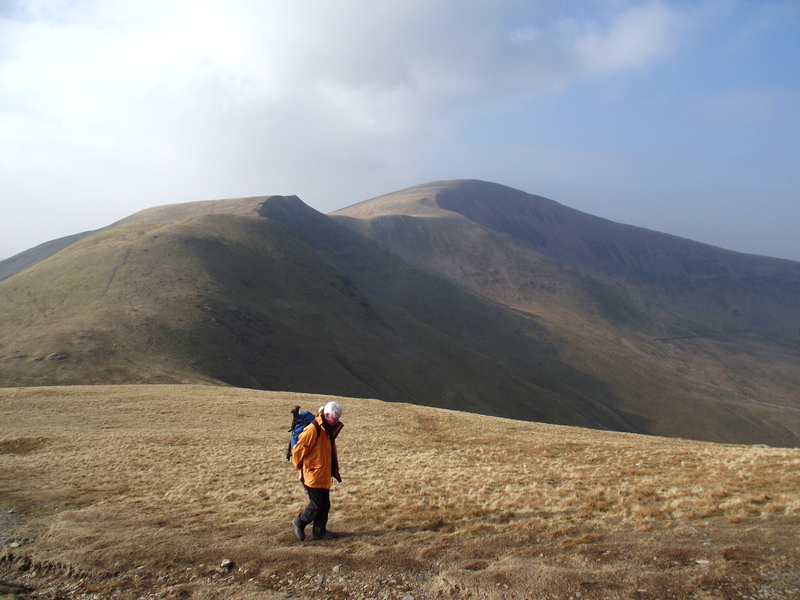 North Wales and tagged hillwalking, mountains, photography, Snowdonia, Yr Wyddfa. Bookmark the permalink. 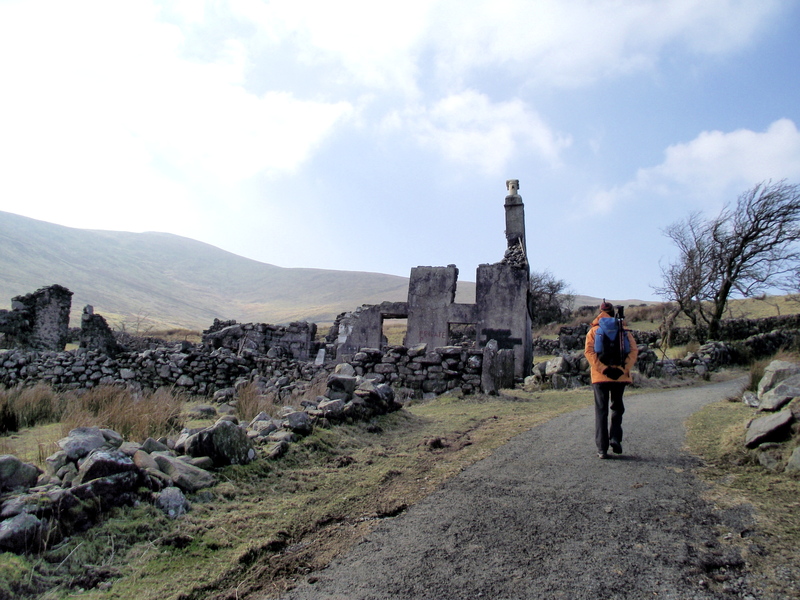 13 Responses to #121 – Moel Eilio – unfinished business! Wow! Have you got a new camera, or was it just the right day for photos? Some superb vistas opening up there. It struck me at the time that these would also be great hills for running, once the initial height gain was out of the way. Wow! 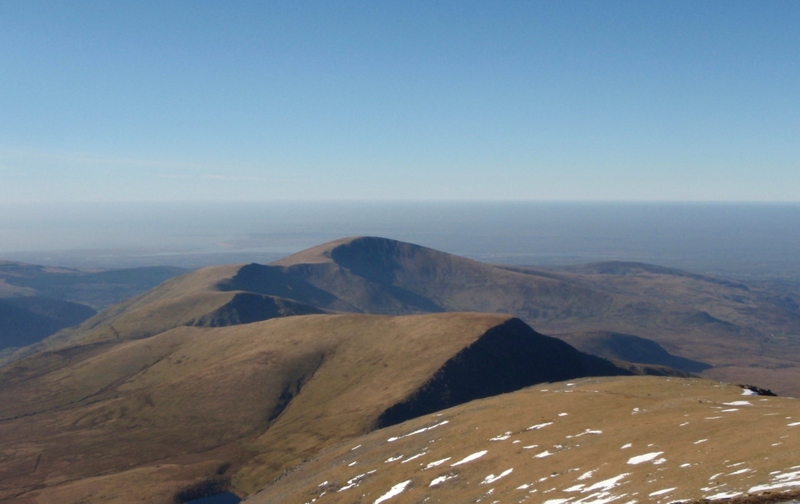 and a perfectly clear day too…the views are stunning Paul – so are the photos…another superb post (wish I was up there right now)! Thanks for that SP – there was a bit of haze early on, but things got better as the day went on. 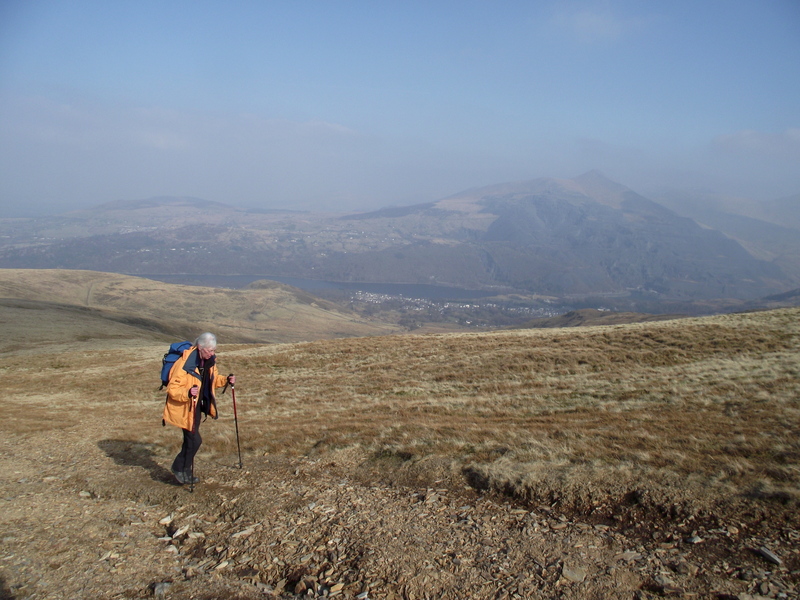 They’re my usual ‘too icy to do Snowdon’ hills – I do them a lot from our club cottage – very nice walk. 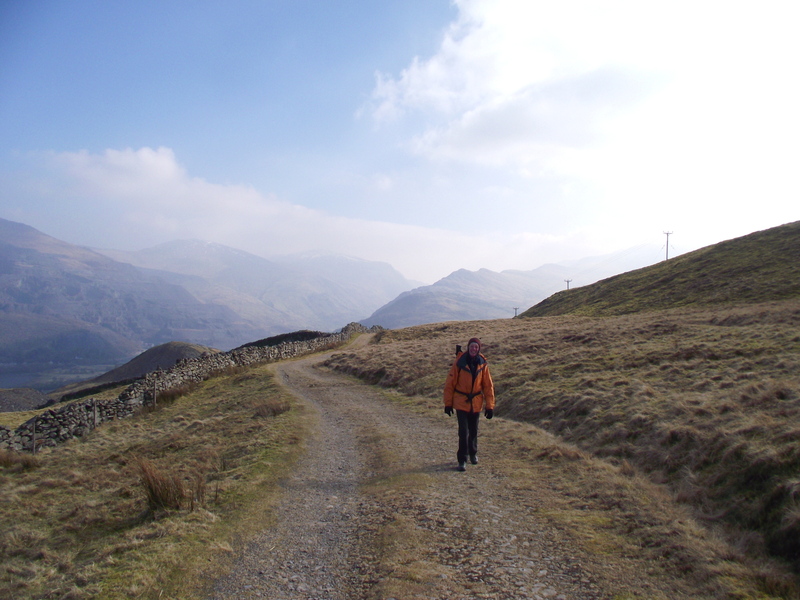 I always go up the ridge above Llanberis though and along the hills to the pass and then back on that. 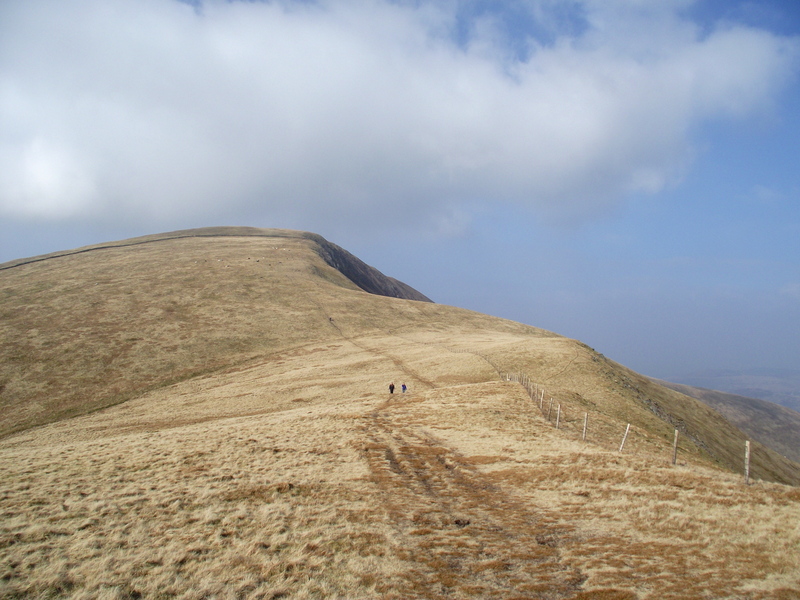 Once though, I went up that ridge you can see in front of Moel Eilio’s summit in your first photo – it was steep and a bit exciting (by my standards) towards the top (I went on the narrow side of the fence) but great fun. I’m late commenting on this. Took a quick peek a week ago and was supposed to come back to it map in hand. Something went wrong: memory loss! 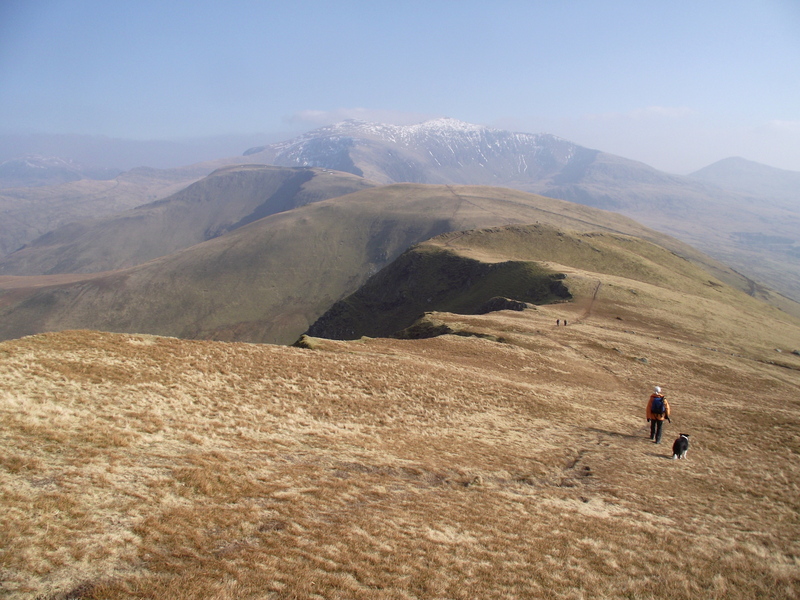 Another great weather day – are you getting all the fine weather up there? 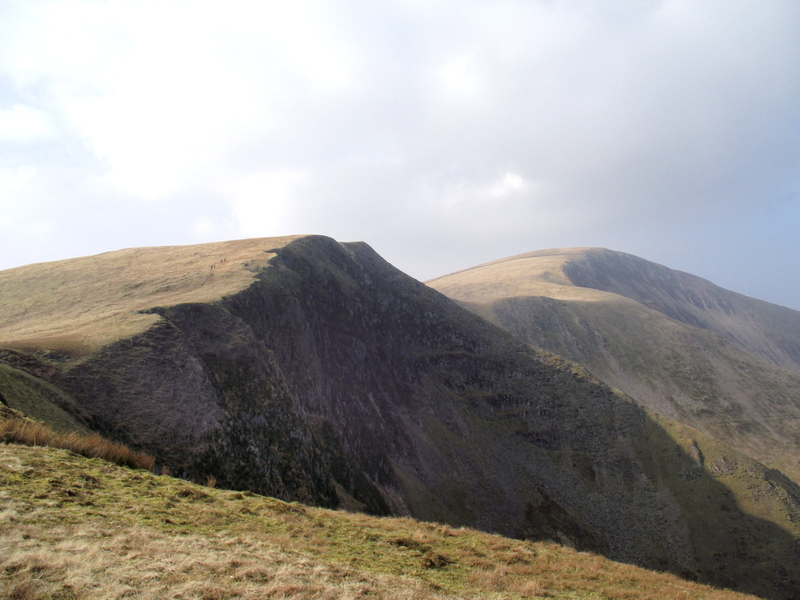 Another route on my lengthening list except I had the idea of descending the ridge from Snowdon via Moel Cyngorion and then dropping off Moel Eilio to Betws Garmon (I’m told there’s a path off it that way but as so often it’s not shown on the map). 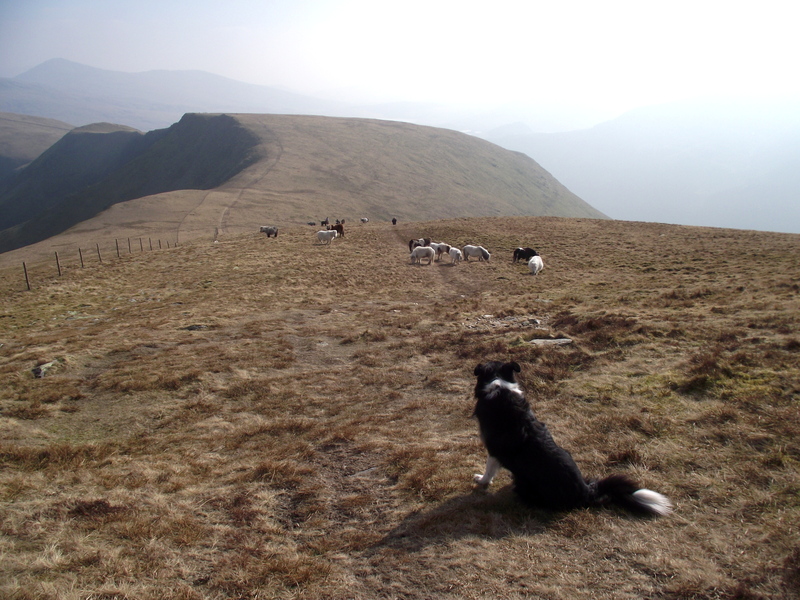 Some great images and what a great ridge it looks from all angles, Paul. 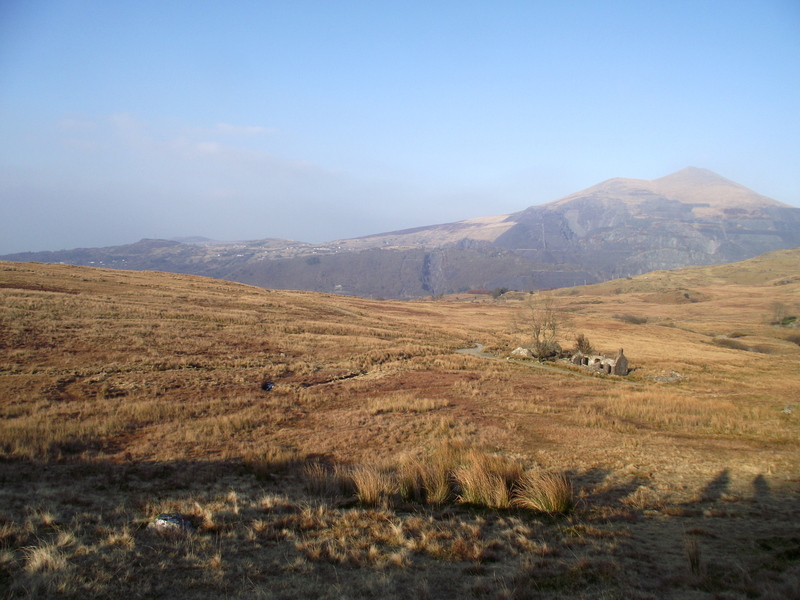 Combining Moel Eilio with Yr Wyddfa should make a very satisfying day – I checked Google Earth to see if there was an obvious path from Moel Eilio to Betws Garmon, and there appears to be something following the line of the parish boundary, just north of west. It continues to a wall then disappears, and I can’t see anything obvious from there. There are crags in the area shown as ‘Y Diffws’ on the 1:25k map, that you probably wouldn’t want to get mixed up in. 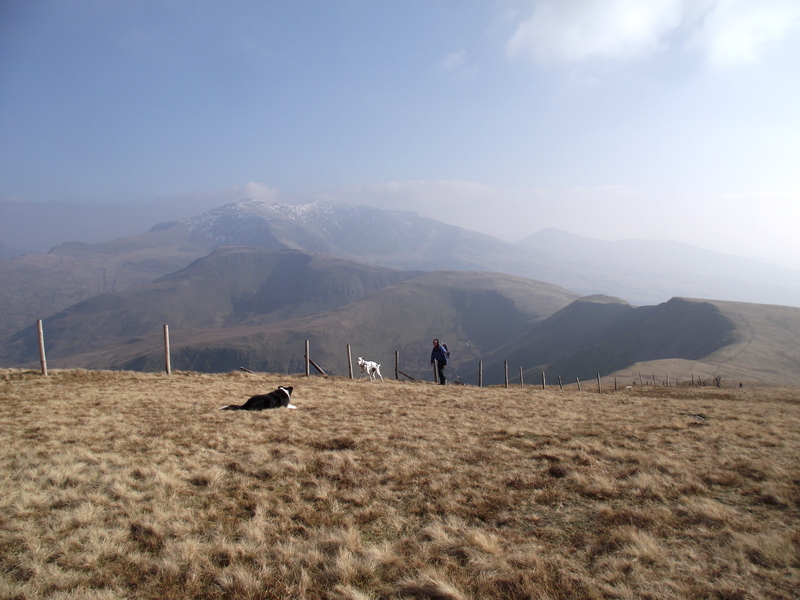 I’m out on a training weekend with the search dogs in a few days, working from Rhyd Ddu – if they use any areas near Betws Garmon I’ll keep a lookout for any illusive paths.